Success is not guaranteed. There are no aid stations, teeming with volunteers waiting to tend to your every need and encourage you to continue. There are just miles and miles of empty road. Your friends can follow your progress from afar, but no pacers can carry your burden for you. If you do encounter another runner, theirs is the same desperate plight as your own. You will have doubts. Finishing will often seem an unfathomable dream. Your worst enemy may become the knowledge that an air-conditioned ride to your car at the finish (in the dreaded seat of “disgrace”) is but a phone call away. The 2013 Last Annual Vol State Road Race started with a ferry ride across the Mississippi River to Dorena Landing, Missouri. Odd as it was, but fitting for the group of ultrarunners, everyone went ashore in Missouri to run back onto the ferry to cross the Mississippi, and hit the ground running in Kentucky. Well, that sounds good, but actually, only a few hit the ground running. Most just walked off the ferry and continued to walk up the first gentle hill. Then, they ran. I ran from the ferry until I tired going up the first big hill in Hickman, Kentucky. The hill was steep and led to a great view of old Hickman and the Mississippi River. However, we were only in the first mile of the 314 mile race, so walking up the last half of the hill seemed like a good idea. I ran up this hill last year to no great benefit. This year…a new tactic, which I was sure, would improve the outcome several days later. Ha! The weather at 7:30 in the morning was comfortable. But, we could tell, it was going to heat up quite a bit later in the day. I wore my trusty Camelbak Octane LR backpack, which I used last year with complete satisfaction. The “LR” signifies a lumbar reservoir with fluid resting in the hip area. That makes it infinitely more comfortable for me, especially when running in the heat. The pack held my essentials and water for the run. I ran comfortably leaving hilly Hicksman and striding into the long level terrain. It would stay this way through the first day except for a few rolling hills that offered no great challenge. It always seems that I find myself running alone in these types of races. Perhaps, I subconsciously find those gaps in which to run, so I can stay away from people. Antisocial? Maybe. Or, perhaps, I’m so slow that I’m just behind everyone. Whatever. I felt good in my Newton Gravitys as I strode toward Union City, Tennessee. About the only “plan” I had was to try and run as much as possible without getting totally fatigued causing me to spend too much down time. Hopefully, my sleep sessions duration would be minimal. Before getting to Union City, I accepted a bottle of water from a man who was checking his mailbox. After greetings and brief conversation about what we were doing (he had seen others running by his house) he gave me the water and wished me luck in my run “home.” It was “home” because the race ended in Georgia, my home state. The water carried me into Union City and higher heat. Even though the distance was approximately twenty miles, trouble raised its ugly head. I found myself feeling weaker and more fatigued than I should have been. I found Coke to drink which usually peps me up but not this time. I ran on hoping for a change as usually happens in these runs. It changed all right…for the worse. At one point, upon urination, I had blood in my urine and slight pain when I ran afterwards. I took in more fluids. I rested in the shade and took a thirty-minute nap. That helped for a while, but the problem returned later. I had to repeat the process. This was not good. This was the first day, and I was still under thirty miles. I dreaded to think what lay ahead. The running, the breaks, the pain continued as I ran toward Martin, home of the University of Tennessee at Martin. I was losing valuable time taking the breaks to make the pain subside. The drinking didn’t seem to help the dehydration problem. I deduced that I had a dehydration problem by thinking back to the days before the start of the race. I knew I was drinking enough now that I was in the race. I think the problem was that I didn’t drink enough in the week previous to the race and so reached this state of dehydration causing the bloody urine and pain. My drinking during the race could not catch me up to an adequate hydration level. I tell my high school runners whom I coach to make sure they drink water throughout the day so they will not suffer dehydration problems running in the heat once we start the cross-country season in August. Then, I do what I tell them not to do. Great! After losing a great amount of time, I finally made it to Martin. I was at approximately 28 miles. I was still wondering if I was going to make this thing before the days ran out. We had ten days to complete the 314 miles. I was a turtle. Then, something happened. Entering Martin, I noticed a man pulling out of a parking lot driving a 1959 Ford Fairlane; I noticed this because that was the kind of car my family had as I was growing up in Trion, Georgia. Anyway, the man stopped right in front of me, asked me if I wanted a cup of tea he had just bought at McDonald’s. Of course, I took it and drank it. I ran on. After about ten minutes, I noticed that I had no pain and was running a little better. Was it the tea? Did I finally get my hydration caught up to its proper level? Whatever the answer, I ran into the McDonald’s and rested and drank more tea. Running through Martin, I felt a lot better. But, it had taken me into the evening to run 30.9 miles. I wasn’t only a turtle, I was a slow turtle. The turtle kept running through Dresden, which would be 39 miles. Feeling better but still feeling weak. Dresden is a comfortable looking little town. I try to envision me living in the towns I pass through, and, I think, Dresden may top the list. Putting Dresden behind me aimed me toward Gleason. Gleason would be my sleeping point in the first day. 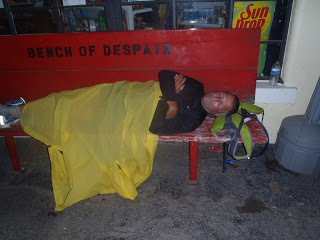 I ran into town late into the night only to discover a fellow runner, Charlie Taylor, sleeping in a sleeping bag liner while lying on a nice, soft, cement, store front deck. I opted to sleep beside a church and on the grass in my SOL emergency bivvy. It started as a restful sleep but was interrupted by a barking dog that sounded like it was just next door. It seemed to bark continuously. I wondered why the owner didn’t come out and shoot it. After about three hours of sleep, I cranked up again and headed toward McKenzie. McKenzie was where I made it to last year to find sleep the first night. I was behind last year’s pace but still moving forward. I was feeling weak even though I was confident that I was over the bloody urine and pain. Still, I was concerned about my extreme fatigued state. This hounded me as I trudged toward Huntington in the increasing heat. My legs felt unresponsive with the general fatigue. And, I was running soooo slow. My thoughts during this section were to get out of the heat, get a motel room and then soak in a tub of ice water. I hated the thought of doing that, but the results proved positive. Running into the center of Huntington, I asked a mailman where a motel was, and he told me there was one about a mile straight ahead. I ran out of downtown Huntington which was, thankfully, downhill and reached the motel. Once there, I remembered passing the place in last year’s race. Luckily, they had a room available. I checked in, got ice from the ice machine and poured it into the bathtub filled about a quarter with water. I plopped down into the ice-cold water. The sound that any other guests heard was my screaming like a middle school girl as I sunk into the cold abyss. Ugh! After about twenty minutes freezing my #&*^% off, I eagerly exited the wet pit of hell, dried off, and took a nap. Forty-five minutes of sleep in air-conditioning with frozen legs seemed to make me feel better as I stumbled to get dressed to continue the adventure. I saw a fellow runner checking in as I left the motel. I did feel better. I don’t think I was running any better, but I did feel better. I took this “better” feeling toward the big town of Lexington. I looked forward to reaching I-40 which would be 80 miles. This would provide another break from the heat and some food and drink. My oasis was the golden arches where I downed a Big Mac meal with a large Coke. After that, the road. But, the thing was…After a few miles, I would see the Lexington City Limit sign which was a clever ruse making a tired ultrarunner think he was entering a town. Oh, but no! That point was just where the sidewalk started and seemed to go forever before actually getting into the town proper. But, I did get there late in the evening as darkness was swallowing my route. I took a break and drank two chocolate milks as I watched the local teens cruise around the courthouse. With that entertainment behind me, I left Lexington and ran the hills to the east toward Parsons. I was tired; it was dark; I had 48 miles for the day. Time to find a place to sleep because I wasn’t sure there would be a suitable place between here and Parsons. A Jehovah’s Witness Kingdom Hall served my purpose. It had a covered area for cars to drive through at the entrance doors. I spread my bivvy on the hard concrete drive under the roof. I didn’t sleep well…My legs didn’t seem to want to stop moving. But, I did get some rest. The night was cooler than usual, and I had trouble staying warm as I tried to sleep. I pulled out my long sleeve shirt from my pack, slipped it on and was a little warmer. After a night of constantly rearranging myself inside my bivvy in order to stay warm, I finally decided the warming measure was to get up and run. I kept my long sleeve Dri-Fit shirt during the first few miles until I warmed up. A long sleeve cotton shirt would have felt warmer than the thin Dri-Fit, but I survived the cool as the miles warmed me up on the road to Columbia passing through Chesterfield, Darden, and into Parsons. It was morning as I sauntered into Parsons, which was a little over 100 miles into the race. Well, maybe I wasn’t “sauntering” at this point…more of a jog as I approached Sonic. The Sonics are great places in this race if only because they have the big milkshakes. I sat at a table outside and promptly fell backwards on the concrete as the bench and table fell over with my weight. Three employees ran to my aid sputtering all kinds of apologies. They explained that a lady drove into the table the day before and bent the opposite bench and knocked the table from its moorings. I picked that table to sit for my milkshake. But, the management did give me the shake for free with a Coke chaser. So, I was satisfied. 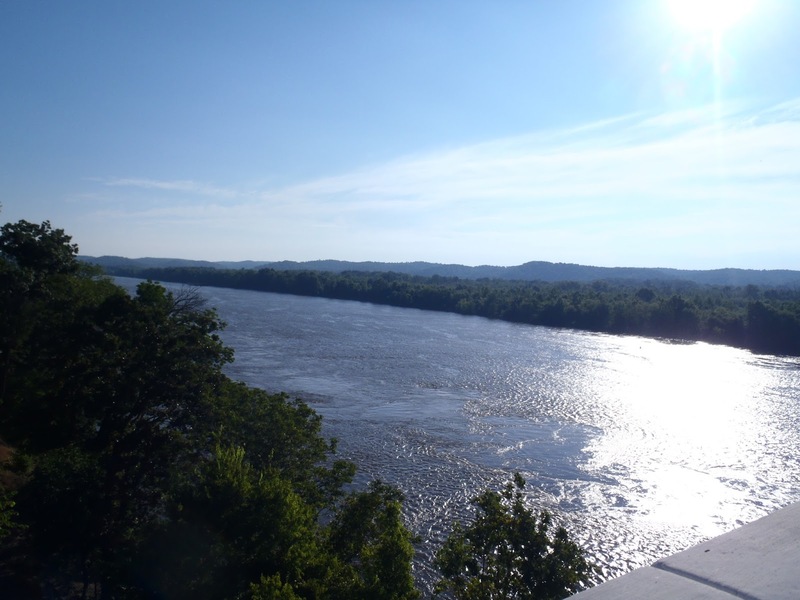 With a tummy full of milkshake, I headed toward Perryville and the Tennessee River. I took a break at Fat Man’s on the other side of the river. Fat Man’s is a combination restaurant and store. It has a large covered deck beside the restaurant, and I took advantage of this for a rest before climbing into Linden. The stretch from the river through Linden is one of the least enjoyable parts of the race for me. The hills are part of it, the almost non-existent road shoulder is another part. I was glad to get Linden behind me. Then, the long road to Hohenwald. After the hills of Linden, the road flattens leading to a few hills going to Hohenwald. I ran into town and reached the east side. Here, I came to a motel and the temptation of sleeping in a bed after a shower was great. But, I resisted and slept on the ground on top of a small ridge across the parking lot from the motel. A tree and bushes kept me out of sight during the night. I went to sleep after eating two Clif Bars and drinking a Dr. Pepper. This was approximately 150 miles. One of the most pleasant points of the run was the campground at the Natchez Trace. Last year, Charlie Taylor and John Price introduced the place to me as a great aid station stop. Bill, the campground owner, fed us food that he had and even offered to cook something up if we wanted it. I ate the salads and had endless refills of tea and Coke. This year I was alone upon reaching the place, but Bill took care of me. He cooked me some eggs for breakfast and filled me with orange juice. He asks for no payment, but upon my insistence, he took two dollars and wished me luck. He is surely a friend along the road and is there to help the weary traveler. He is one of the high points of the race. Hampshire. A very small, postcard town and very friendly. I got to the store too early and had to wait for church to end before the store would open. By the time it opened, a few other LAVS runners were there to eat some sandwiches and drink some fluid. I chose to eat ice cream and drink Coke. After eating, I took a break at the “Mens Club,” which was a big, rundown room in a two-story building. They offered a shower if needed and sofas for a nap. While sitting in front on a bench, I was startled by a piercing Tarzan yell that seemed to come out of nowhere. Upon looking around, I then noticed a sign across the road that stated Tarzan yells for $2.00. I guess someone paid. They also had Elvis hair for sale along with an odd assortment of used items. Quite a place! US 412 took me into Columbia. There was nothing spectacular or even noteworthy about this stretch of asphalt. I traversed some rolling hills and felt comfortable running through a lot of level terrain. The expectation of reaching a large town like Columbia was the driving force during this section of the run. I was pretty tired on the south side of Columbia after making the turns through town. At this point, the road took a ninety-degree turn to the left and headed east. I was tired and hungry and was not sure what was ahead in terms of food. I knew I was headed out of town, so I took advantage of the available food in close proximity. That put me in a Mexican restaurant with me as the only customer. I wanted black bean burritos, but, as luck would have it, they were out of black beans. So, a bean burrito meal served the purpose…and it was really good and filling. I felt a lot better and energized after the food, Coke, and rest. The next point I was looking forward to was the “Bench of Despair” in Glendale. The “Bench of Despair” is an ordinary wooden bench in front of a store that also serves sandwiches and milkshakes, etc. Once there, I decided to take a nap. The store was closed at the late time I arrived. The bench was so named because, as legend has it, several runners would make it to this point; sit on the bench and give up on the race. The store owner learned of this nickname for the bench and had the name painted on it. Now, it is a pictorial part of the Vol State legend. After sleeping on the “BOD,” I had an easy run through Culleoka and Mooreville. I stopped at a store and deli located in the big curve in Mooreville. This place looked and felt like it had not changed since the 1940’s, if it had been there that long. Some old men gathered in the back at the tables and talked over the country’s problems. Most of their solutions sounded good to me. They asked me about the run and where I was from and wished me luck telling me what lay ahead on the way to Lewisburg. Lewisburg was another large town and was about 200 miles into the race. I was treated by finding a Cheerwine drink as I left town on the east side. This Carolina based soft drink tasted really good…I don’t know how much energy it gave me, but it tasted good and was refreshing. I was on my fifth day of running. I felt a lot better than the first two days. My feeling of staleness and general fatigue in the legs had abated. Now, I experienced the normal fatigue a multi-day race offers. I now felt confident of finishing. The terrain from Lewisburg to Wartrace was fairly easy with some rolling hills and a lot of flat road. I ran through Farmington, Wheel, Bedford, Shelbyville, and into Wartrace at night. Wheel was a place with just a few houses and a church with a large pavilion that had a water pump beside it. The pavilion offered a break from the sun and a picnic table to lie on for reclined rest. The pump water was refreshingly cold. I drank my fill, doused my head and hit the road after a ten-minute break on the table. This would be a good place to camp if I ever got here at a time for sleep. I slept on a rear porch with a cement floor at the post office in Wartrace. It had a roof so I was satisfied in case it rained during the night. Again, I did not sleep well. It wasn’t the hardness of the sleeping surface that kept me up every fifteen minutes or so. I just felt restless and could not get into a deep sleep. I started to get up and continue to run, but I wanted to wait until the store across the street opened up for the day. Then, I would get some chocolate milk and be on the road again. Wartrace was 232 miles into the race once I crossed the railroad tracks. I knew I would have some hills leading me out of town. And, when I got to Sixteenth Motel Road, there were some serious hills. I just kept looking forward to getting closer to Manchester where the road would be flatter. I slept behind an abandoned fruit stand last year as I was leaving Manchester. I was ahead of last year’s pace and ran through Manchester in the daylight. Even with the fatigue of five days of running and restless sleep, I looked forward to the valley I would run through before running up Monteagle Mountain. This was a flat road with lush farmland on each side. It was a valley of green. The small picturesque towns I ran through were Hillsboro, Glen, Ruthledge Hill, Pelham, and Mt. View before the climb to Monteagle. Even though there was a mountain between me and the finish, I could smell the finish line on “The Rock.” Once I got to Monteagle, I sat at Sonic drinking my milkshake and contemplated the rest of the race. It was about forty miles to finish this thing. I would keep going until I finished. I liked running on Monteagle Mountain, not up it, just on it…that would be along the top where it was basically flat until going down into Jasper. Once on top, it would lead me into Tracy City in darkness. Tracy City seems to be a haphazard town the way the route leads through it. I was glad to get through the Tracy City maze and back on the lonely part of US 41. Here, there was nothing but forest along the road…and darkness. I think I saw a T-Rex chasing a Brontosaurus across the road ahead of me. They paid me no mind being intent on bigger game or survival. At the finish, I was assured by Laz and Carl, the race directors, that it was just another Vol State hallucination. Just normal stuff…not to worry. I was nearing the finish in good spirits. I felt good the last few miles crossing the Tennessee River for the last time. I had run through Jasper at the foot of Monteagle Mountain, ran through Kimball and into South Pittsburg. I had run through the night but felt good. I picked up the pace through the rolling hills in the New Hope area. It was hot, but I was not bothered by it. I increased my lead on Ray K through this area. I was in 6th place in the sole, uncrewed division (called the “screwed” division by the runners) but I didn’t know that at the time. In this race, one can get the feeling of running alone and being detached from the other runners and race directors. A lot of time is spent running by oneself, and the runner may be within a mile or closer to other runners but would not know it. How the runner handles the running in solitude may determine the runner’s outcome. I struggled up Sand Mountain with its severe climb for two plus miles. It was run and walk to make it up the incline. Crossing into Alabama brought me closer to the top, and I was able to run on in to the finish. Last year, I finished in the dark. This year…daylight. It was a good finish. I was lead to the finishers’ chair, a canvas folding camping chair under a tent. My time was 148:56:16 (6 days, 4 hours, 56 minutes, 16 seconds). I improved over last year’s time by 15 hours, 17 minutes, 39 seconds. I was satisfied with that especially after the trouble I had in the first two days.